The Italian Marxist Antonio Gramsci coined the term “organic crisis” to describe a crisis that differs from ”ordinary” financial, economic, or political crises. An organic crisis is a “comprehensive crisis,” encompassing the totality of a system or order that, for whatever reason, is no longer able to generate societal consensus (in material or ideological terms). Such a crisis lays bare fundamental contradictions in the system that the ruling classes are unable to resolve. Organic crises are at once economic, political, social, and ideological—in Gramscian terms, they are crises of hegemony—and they usually lead to a rejection of established political parties, economic policies, and value systems. However, they don’t necessarily lead to the swift collapse of the dominant order. Gramsci described these situations as interregna in which “the old is dying and the new cannot yet be born” and during which time “a great variety of morbid symptoms” can appear. Gramsci was talking about Italy in the 1910s. A century later, the country is facing another organic crisis. More specifically, it is a crisis of the post-Maastricht model of Italian capitalism, inaugurated in the early 1990s. This model, I argue, can be described as a peculiar kind of comprador capitalism—a term generally used in the context of the old colonial system to describe a regime in which a country’s ruling classes ally with foreign interests in exchange for a subordinated role within the dominant hierarchy of power. Though the crisis has been brewing beneath the surface for some time, it became apparent in the latest general election, which was held on March 4, 2018. The results of the election are well known. The political establishment that has ruled Italy for the last quarter century, embodied by the Democratic Party (PD) and Forza Italia, suffered an unprecedented collapse, securing, respectively, 18.7 and 14 percent of the vote. Meanwhile, the two major “anti-establishment” parties—the Five Star Movement (M5S) and the Northern League (Lega)—experienced a spectacular surge, winning, respectively, 32.7 and 17.4 percent of the vote. Overall, the center-right coalition—which includes, alongside the Northern League (now the coalition’s dominant party), Silvio Berlusconi’s Forza Italia, and the small post-fascist party Brothers of Italy (Fratelli d’Italia)—won 37 percent of the vote. Every other party—from the über-liberal, pro-European More Europe (+Europa), in coalition with the PD, to the center-left Free and Equal (Liberi e Uguali), an offshoot of the PD running against it, to the radical Left Power to the People (Potere al Popolo)—failed miserably. Of these, only Free and Equal barely surpassed the 3 percent minimum threshold for parliamentary representation. Although there were obvious losers, the election did not yield a clear winner. 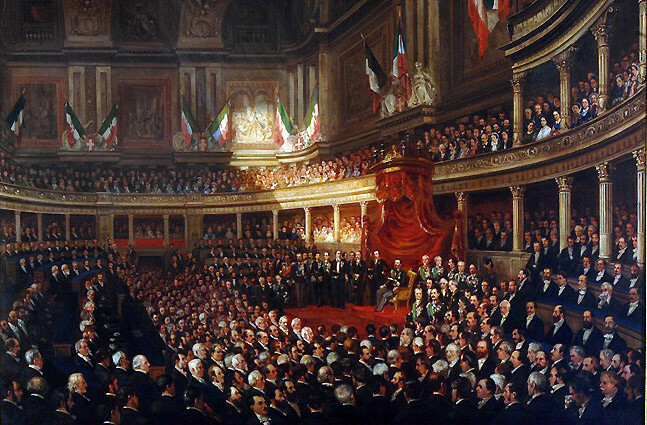 The country’s new electoral law—approved in 2017 by the PD, Forza Italia, and the Northern League with the clear aim of containing the Five Star Movement—requires any party or coalition of parties to obtain at least 40 percent of the vote (in the ballot box or through a post-electoral alliance) in order to claim a majority and thus form a government. For the past two and a half months, M5S and Lega—the two most obvious candidates to form a workable coalition structure—have been engaged in tense negotiations. At the time of writing, it would appear that an agreement between the two parties has been reached, though details have yet to be made public. Thus the shape of Italy’s next government remains unclear. We also cannot rule out the possibility that the two parties fail to overcome the current gridlock, leading to the president appointing a temporary “technocratic” government or even to new elections. Nevertheless, regardless of the outcome of the negotiations, one thing is clear: this election has changed the Italian political landscape forever. The downfall of the political establishment—and the rise of the “populist” parties—can only be understood against the backdrop of the “the longest and deepest recession in Italy’s history,” as the governor of the Italian central bank, Ignazio Visco, described it. Since the financial crisis of 2007–9, Italy’s GDP has shrunk by a massive 10 percent, regressing to levels last seen over a decade ago. In terms of per capita GDP, the situation is even more shocking: according to this measure, Italy has regressed back to levels of twenty years ago, before the country became a founding member of the single currency. Italy and Greece are the only industrialized countries that have yet to see economic activity surpass pre–financial crisis levels. As a result, around 20 percent of Italy’s industrial capacity has been destroyed, and 30 percent of the country’s firms have defaulted. Such wealth destruction has, in turn, sent shockwaves throughout the country’s banking system, which was (and still is) heavily exposed to small and medium-sized enterprises (SMEs). Italy’s unemployment crisis continues to be one of the worst in all of Europe. Italy has an official unemployment rate of 11 percent (12 percent in southern Italy) and a youth unemployment rate of 35 percent (with peaks of 60 percent in some southern regions). And this is not even considering underemployed and discouraged workers (people who have given up looking for a job and therefore don’t even figure in official statistics). If we take these categories into consideration, we arrive at a staggering effective unemployment rate of 30 percent, which is the highest in all of Europe. Poverty has also risen dramatically in recent years, with 23 percent of the population, about one in four Italians, now at risk of poverty—the highest level since 1989. These abysmal numbers are the result of both conjunctural and systemic causes, though the two are, of course, interrelated. From a conjunctural point of view, they are largely the of result of the severe austerity policies instituted by Mario Monti’s “technocratic” government in 2011–13. Monti himself admitted in an interview with CNN that the aim of the austerity policies was “to destroy domestic demand through fiscal consolidation.” These policies were continued by all successive governments, including the Renzi government (2014–16) and the outgoing government, led by Paolo Gentiloni. Though the study in question only examines the period up to 2015, the government’s contractionary fiscal stance has remained largely unchanged in recent years. Indeed, Italy is one of the few countries to have maintained a significant primary budget surplus—today equal to around 1.5 percent of GDP—throughout the entire post-crisis recession, contrary to economic common sense.1 The consequence has been a drastic erosion of the welfare state (particularly the healthcare system). At the same time, an ever-expanding array of new taxes has alienated small and medium-sized business owners as well. Fear, loathing, unemployment, precariousness, and poverty: these are the causes of the watershed vote of March 4. The Five Star Movement and the Lega capitalized on the widespread dissatisfaction with the status quo, by focusing on social protection (especially M5S), lower taxes (especially the Lega), and greater migration control (both). At the same time, voters explicitly punished the party considered largely responsible for the situation: the PD. The party is without the doubt the election’s biggest loser, having seen its vote total plummet by more than half in just a few years (in the 2014 European election it garnered 41 percent of the vote). This abysmal performance is yet another example of “pasokification,” whereby nominally center-left, social-democratic parties, like many of their center-right counterparts, are punished by voters due to their embrace of neoliberalism and austerity. (The term pasokification refers to the Greek social-democratic party PASOK, which was virtually wiped out of existence in 2014 as a consequence of its inane handling of the Greek debt crisis, after dominating the Greek political scene for more than three decades.) Other center-left parties suffering the same fate in recent years include the French Socialist Party and the Dutch Labor Party (PvdA)—and, now, the PD. Pasokification might be too soft a term for the PD, however. Where PASOK and other similar formations started out as genuine social-democratic parties, only to be subsequently corrupted by neoliberal ideology, the Democratic Party was born in 2007 as an avowedly neoliberal-centrist “third way” party, in contrast to the historic (communist and socialist) tradition of the Italian Left. The PD was to be a party finally cleansed of the dead weight of twentieth-century leftwing mass politics and ready to embrace the brave new world of post-ideological politics. Out were heavyweight theories, class conflict, state interventionism, and economic redistribution; in were economic liberalism, market rule, individual (rather than social) rights, innovation, governance, and responsiveness. The creation of the PD should be seen as the end point of the Italian post-communist Left’s decades-long shift to the right. This process began in 1991 with the transformation of the Italian Communist Party (PCI) into the Party of the Democratic Left (PDS), already purged of any reference to socialism in its name. This was subsequently renamed Democrats of the Left, and, finally, having dropped any reference even to the “Left,” PD. At every turn, the party grew further apart from its original support base, the working classes, while refashioning itself as a party of the (shrinking) urban progressive middle and upper classes.
. . . the only true class-based party, whose electorate is mostly composed of affluent people with higher degrees. Only 8 percent of the unemployed and 12 percent of the working class voted for the PD. More interestingly yet, according to a SWG survey, less than one third of the voters who had chosen PCI in 1988 voted PD in 2018. In short, the PD’s defeat can only be understood in the context of the decades-long metamorphosis of the Italian Left. This, in turn, can only be understood in the context of the tectonic shifts that have occurred in the Italian political economy over the past thirty years. In this respect, the country’s economic crisis is but an epiphenomenon of a much deeper “structural” crisis of Italian capitalism (albeit dramatically accelerated by the postcrisis policies). In economic terms, Italy has been in a de facto crisis since well before the 2008 financial crash. Up until the late 1980s, the country enjoyed three decades of relatively robust growth; then, beginning in the early to mid-1990s, all its main economic indicators—productivity, industrial production, per capita growth, etc.—began to steadily decline, and have stagnated ever since. This is, to a large degree, the result of Italy’s adoption of an economic superstructure—established by the Maastricht Treaty of 1992, which paved the way for the establishment of the European Monetary Union (EMU) in 1999—that was (is) fundamentally incompatible with the country’s political economy. Given the especially disastrous effects of the euro regime in Italy, the country’s decision to enter the monetary union—and its establishment’s continued defense of that regime—might appear largely self-defeating. However, as Bill Mitchell and I argue in our recent book, Reclaiming the State, the EMU should be understood as a political project as much as an economic one. Throughout the 1970s and 1980s, growing wage pressure, rising costs, and increased international competition caused a squeeze on profits, provoking the ire of large capital holders. On a more fundamental level, the full employment regime “threatened to provide the foundations for transcending capitalism” itself, as an increasingly militant working class began to link up with new countercultural movements to demand a radical democratization of society and the economy. As the Polish economist Michał Kalecki had anticipated thirty years earlier, full employment hadn’t become simply an economic threat to the ruling classes but a political one as well. Understandably, this issue preoccupied elites, a fact illustrated by various documents published at the time. The Trilateral Commission’s oft-cited Crisis of Democracy report of 1975 argued, from the establishment’s perspective, that a multilevel response was required. It argued not only for reducing the bargaining power of labor, but also for promoting “a greater degree of moderation in democracy” and a greater disengagement (or “non-involvement”) of civil society from the operations of the political system, to be achieved by spreading “apathy.” In this context, we can better appreciate why European elites welcomed the “external constraint” of the EMU as a way of depoliticizing economic policy, that is, of removing macroeconomic policies from democratic and parliamentary control through a self-imposed reduction of national sovereignty. Their aim was not simply to insulate economic policies from popular-democratic challenges, but also to reduce the political costs of the neoliberal transition, which clearly involved unpopular policies, by displacing the responsibility for such measures upon external institutions and factors. This can be said to embody what Edgar Grande calls the “paradox of weakness,” whereby national elites transfer some power to a supranational policymaker (thereby appearing weaker) in order to allow themselves to better withstand pressure from societal actors by testifying that “this is Europe’s will” (thereby becoming stronger). As Kevin Featherstone put it: “Binding EU commitments enable governments to implement unpopular reforms at home whilst engaging in ‘blameshift’ towards the ‘EU,’ even if they themselves had desired such policies” (emphasis added). The European Union implies . . . the abandonment of the mixed economy, the abandonment of economic planning, the redefinition of the modalities of composition of public expenditure, the restriction of the powers of parliamentary assemblies in favor of government . . . the repudiation of the concept of free social provisions (and the subsequent reform of healthcare and social security systems) . . . the reduction of the presence of the state in the financial and industrial systems . . . the abandonment of price controls and tariffs. It is clear that Carli understood the European Union first and foremost as a way to spearhead nothing less than the wholesale transformation of Italy’s economy—a transformation that would not have been possible, or would have been extremely difficult, without the self-imposed external constraints (vincolo esterno) created first by Maastricht and then by the euro. So, for example, the Amato government succeeded in 1992 in persuading the Italian General Confederation of Labor (CGIL) to end the so-called scala mobile, the indexation of wages to inflation, not by confronting labor directly but by essentially appealing to the external constraint of the European Monetary System (EMS), the system of semi-fixed exchange rates that paved the way for the euro. Carli himself recognized that “the European Union represented an alternative path for the solution of problems which we were not managing to handle through the normal channels of government and parliament.” Therefore, Italy’s decision to join the EMS and then the EMU cannot be understood solely in terms of nationally framed interests. Rather, as James Heartfield pointed out, it should be viewed as the way in which one part of the “national community” (the economic and political elite) was able to constrain another part (labor). From the establishment’s perspective, the fact that EMU also entailed the deindustrialization and “mezzogiornification” of the country—to the benefit of German and French firms, which have taken over a great number of businesses (or acquired significant stakes in them) in Italy and other periphery countries—and its demotion to a subordinated role within the European hierarchy of power, was a small price to pay for winning the war against labor at home. In this sense, Italy’s post-Maastricht economic regime can be likened to a form of comprador capitalism—a semi-colonial regime in which the country’s ruling classes essentially allied with foreign interests in exchange for more favorable domestic class relations. Ironically, the post-communist Left played a crucial role in legitimizing the narrative of the vincolo esterno; by the early 1990s, its ideological subordination to neoliberalism was so profound that its major representatives had come to believe that the European Union truly was an unmissable opportunity for Italy to finally join the family of “modern” and “virtuous” countries. It is no coincidence that the “economic shock treatment” of the 1990s (particularly the dismantling and privatization of Italy’s once-vast array of state-owned industries) was promoted by and large by center-left governments. One corollary of this loss of democratic legitimacy is that appeals to the logic of the external constraint no longer carry the same weight that they used to. Citizens—not just in Italy—are less and less willing to justify the status quo on the basis of arbitrary and punitive rules and external diktats, the political (i.e., non-neutral) nature of which is becoming increasingly apparent. This is demonstrated by the fact that the attempts of the Italian and European establishment to discredit “populist” proposals on the basis of their alleged fiscal unsustainability, threat to financial stability, or incompatibility with the European framework blatantly failed to achieve the desired effect. Quite the contrary, in fact. Equally counter-productive, from the establishment’s perspective, are the claims of top EU representatives that the new government (whatever that may be) must abide by the decisions taken by previous governments. As more and more people start to acknowledge the anti-democratic and neocolonial nature of the European Union, such scare tactics no longer work. In this sense, the March 4 vote wasn’t so much a vote “against Europe”—even though traditional pro-European parties were severely punished—as it was a vote against depoliticization, and for a repoliticization of the national decision-making process. That is, for a greater degree of collective control over politics and society, which necessarily can only be exercised at the national level. Can the “anti-establishment” parties that gave voice to this demand for repoliticization—Five Star Movement and Lega—live up to expectations? It’s unlikely. Ultimately, neither party offers a viable alternative to the status quo, at least in terms of political economy. Lega’s economic agenda is still very much neoliberal: the party’s main economic proposal is a flat tax rate in place of the current (more or less) progressive tax rates, which is clearly regressive in nature, with a bit of social protection thrown in (abolition of the Fornero law, which increased the retirement age). Likewise, the Five Star agenda, “is a far cry from one of a progressive force,” as Nicola Melloni writes. Even though its narrative, like that of left-wing populist movements, such as Podemos and Occupy, is built around the counterposing of people and oligarchy, the M5S simply reduces this oligarchy “to a corrupt political ‘caste,’” argues Melloni. “Economic issues such as labor and capital relations, inequality, or capitalism itself, are absent. Rather, they are a populist but centrist political force—opportunistic enough to ride any battle that can bring consensus, but without any ambition to change, or even reform, the system.” In this sense, they are a perfect example of the “morbid symptoms” Gramsci spoke about. More importantly, even if M5S and Lega truly did want to change the system, to do so they would have to challenge the euro regime, which neither of them is willing to do. Even though the two parties are commonly described as euroskeptic, or even anti-European, they were both quick to pledge their allegiance to the European Union before and after the election. Yet as long as they maintain this position, they are doomed to fail. As noted above, European institutions have a wide array of tools “to constrain and, if necessary, disable the democratic responsiveness of southern governments,” according to Scharpf. “While Italy has more bargaining power than Greece, it can be equally choked financially,” Zingales writes, just as Greece was in 2015, if it is perceived as a threat to the European neocolonial regime. To conclude, regardless of the outcome of the negotiations or even in the eventuality of a new election, Italy’s organic crisis is here to stay. And it won’t be resolved until its underlying cause is grappled with: the fundamental incompatibility between Italy’s political economy and the single currency. 1 A government that runs a primary surplus is spending less into the real economy than it is taking out of it through taxation and is, therefore, draining wealth out of the economy, usually to redistribute it to foreign and domestic holders of government securities (usually banks and wealthy individuals). Economic common sense counsels that governments in a recession should do the exact opposite: run budget deficits to stimulate economic activity. 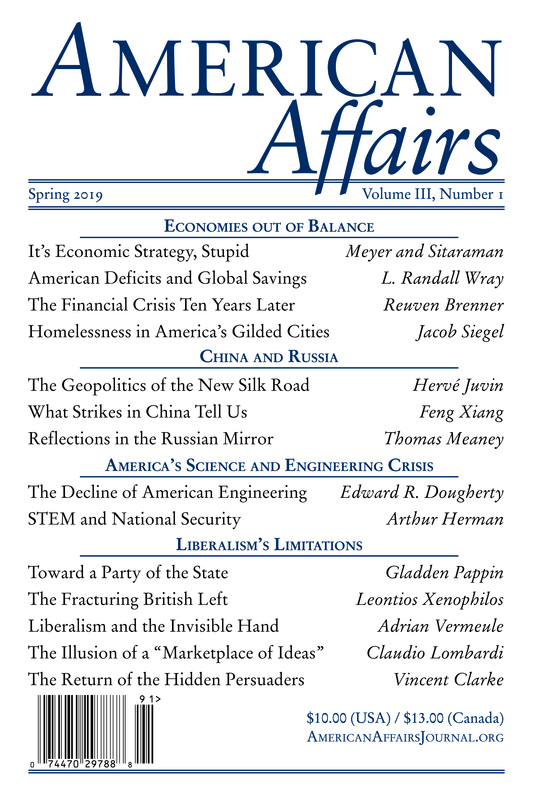 2 See also, Nancy Fraser, “From Progressive Neoliberalism to Trump—and Beyond,” American Affairs 1, no. 2 (Winter 2017): 46–64.